By using analytics tools, IT teams can anticipate network and application performance problems and react in real time. Networks are driving more digital change than ever before, and this increases the pressure on the teams responsible for deploying, monitoring and maintaining them. It means there is a premium on actionable real-time visibility into networks and application performance issues. NetOps teams must proactively find issues on the network before they turn into problems and solve issues in real time to minimize the effects on the end user. The goal is to provide actionable network transaction-based monitoring, rapid root-cause analysis and integrated packet-level forensics in a single solution, so teams can quickly identify latency, communication and capacity issues. However, extracting insight from the flood of information traveling through today’s high-speed networks is a constant challenge faced by those responsible for network performance and reliability. Statistical summaries and aggregated data are traditionally just a starting point for further investigation into problems. And historically, packet data has not scaled for high-speed real-time monitoring. As a result, a new breed of solution has been born (such as Savvius Spotlight) that simultaneously provides the precision of packet-based analytics with the speed of flow-based monitoring (at a reasonable cost). The end result is actionable visibility, which helps teams focus on the biggest problem areas, which essentially requires four elements. First, the data must be acquired from wire data, a datacenter, the cloud or the edge. Next, the network and data must be monitored for end-user experience in true real time. Third, the team must be ready to investigate a problem or issue, from traffic to trace files. And finally, a certain level of the packet data must be retained so teams can troubleshoot. How can this level of network visibility be put into action? When problems emerge, you need to solve them fast. Understanding if this is an application or a network issue – and having the packet data to back up that claim – is critical to eliminating debates and war room discussions. For example, see at a glance which transactions on the networks are experiencing the worst network and the worst application latency, from network-wide down to an individual server. When you see application latency that is outside of the norm, a single click can provide the actual packet data comprising the network transaction. This is the best data possible for determining the root cause of the problem. Often times application errors can quickly be identified in the packet payload data. For many companies, the business is the application(s) they run. For example, an online retailer is defined by the performance of the web servers and associated web applications driving the storefront. Visibility into key performance indicators for these specific applications, including network and application latency and transaction quality for each and every transaction, drives real-time response that keeps the storefront running at its maximum potential. Every second counts when the network or an application has a problem. Having the ability to navigate fluidly in real-time at up to 35 Gbps of network traffic, and then immediately click through to specific packet data dramatically speeds resolution time. Plus, the less time the network team or IT spends troubleshooting, the more time they can spend on projects to improve the network, like cloud migrations or building data warehouses. Teams are sick of adding more and more tools. The new NPM/APM solutions consolidate key functionality and offer flexible new dashboards that allow teams to monitor the information that matters most to their organization and team. 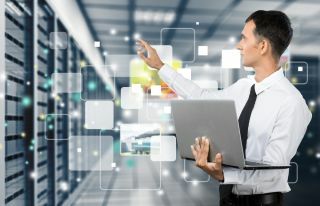 For example, monitor key applications like Office365, WebEx and Salesforce in a single dashboard that includes application performance, network performance, transaction quality and VoIP quality; metrics that in the past required several solutions from several vendors to achieve the same level of visibility. It’s not enough to just be notified of abnormalities and problems. When these happen, you need immediate access to the packets that matter so you can troubleshoot and remediate. Also, NetOps needs information on the worst-performing parts of their network. Many products only calculate and display averages of network metrics like latency, utilization and VoIP quality, which can obscure problems that only affect a small number of flows. For example, a typical network will have thousands if not tens of thousands of HTTP flows at any given moment. If only a few exhibit poor network latency, and the dashboard shows the average network latency for all HTTP (which many dashboards do), the few flows that exhibit poor network latency will be masked by the good performance of all of the other flows. This example illustrates the absolute need to be able to pick the worst flows, out of millions, at any given moment to make sure critical issues are not overlooked. Whether you’re offering a service or using one, being able to validate the agreement is critical, especially if problems arise. Packet data doesn’t lie, which means if you have that information, you have what’s needed to ensure SLAs are being delivered. Using today’s modern dashboards, you can set your SLA thresholds for network latency, application latency, transaction quality and VoIP quality, and let the software constantly monitor millions of flows and let you know when even a single flow exceeds your SLAs. As mentioned above, there’s real cost associated with any kind of operational downtime, so avoiding or at least minimizing these issues is a NetOps priority. Therefore, it’s critical to maintain a high-quality end-user experience for employees and customers. The powerful new analytics tools available today allow IT teams to anticipate network and application performance problems and react in real time. Rather than waiting for complaints, it’s now possible to monitor every aspect of network traffic and performance at an incredibly granular level, making network problems much more visible even as the speed and volume of network traffic rises dramatically. The vision of network continuity all day, every day, across the entire network, is finally here.